The rice rolling paper is unrefined and unbleached with natural arabic gum. Our natural brown paper is 1 1/4 size and contains 32 papers to a booklet.This is a perfect giveaway for medical marijuana dispensaries or cannabis shops. Your custom imprint on the cover as shown. Available Imprint Options: Price includes a one color imprint. Full color is additional. Please inquire for pricing. 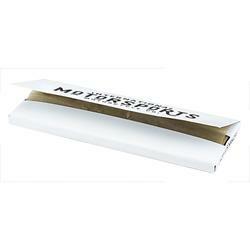 Natural Brown Rolling Paper - Unbleached, Unrefined with a white cover.